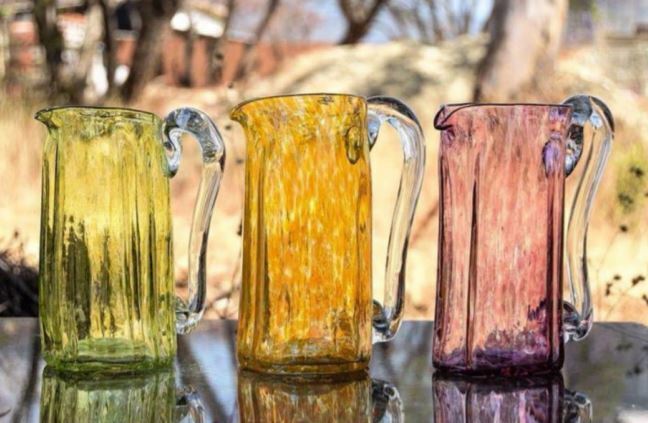 Let me tell you a bit more about our premium collection of hand-blown glassware. This collection, available in seven colors, stands out by its pure beauty: the organic shapes, brilliant colors and a remarkable transparency. When light reflects, the tumblers evoke a dynamic dance of bright colors. This play of light gives the glasses a luxurious and pure character at the same time. The glasses are mainly sold as drinking glasses and very trending in high-end cocktail bars. 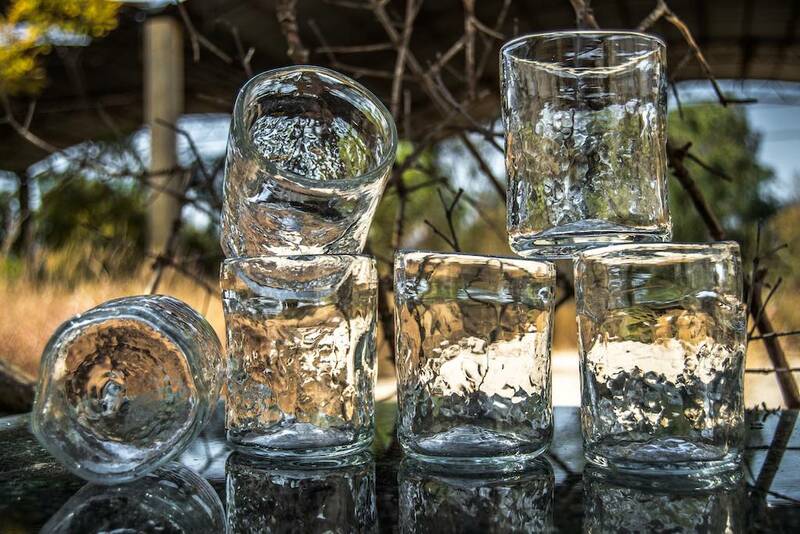 But the beauty of these tumblers is an invitation for creative & multipurpose use. They look marvellous as candle holders, flower vases, storage units or simply to add a touch of color to your interior. The jars with an organic form are my personal favorite because they remind me of the Art Nouveau Epoque, my favorite style period in Belgian Architecture. I am also a very big fan of the extra-large carafes, designed and hand-blown by one of the owners of the glass workshop. Look how subtle the colors mingle. All the glassware is created in a fair-trade studio, ensuring honest working conditions and salaries for their employees. Up until now, seven local workers were trained to become an artisanal glass-blower. It takes guts and discipline to become one, as it is a very demanding job. Daily, six men and one woman put their heart and soul in every object they produce. Each glass is a unique piece of art because the glassblowers do not work with molds. No glass is identical. The manufacturing process could be more automated but this is not the goal of the passionate owners, a Mexican woman and an American man, both glass specialists. The most impressive must be the sustainable character of this Mexican studio. I visited the studio last year and was shown around by the owners. I was blown away by the persevering circular character of this business in the middle of nowhere in Mexico. No energy source is wasted during the production process. Each new glass is made out of recycled glassware collected by local village communities. The ovens and equipment are powered by recycled oil. The production process itself is energy efficient, reusing heat from one part of the process and funneling it to another. 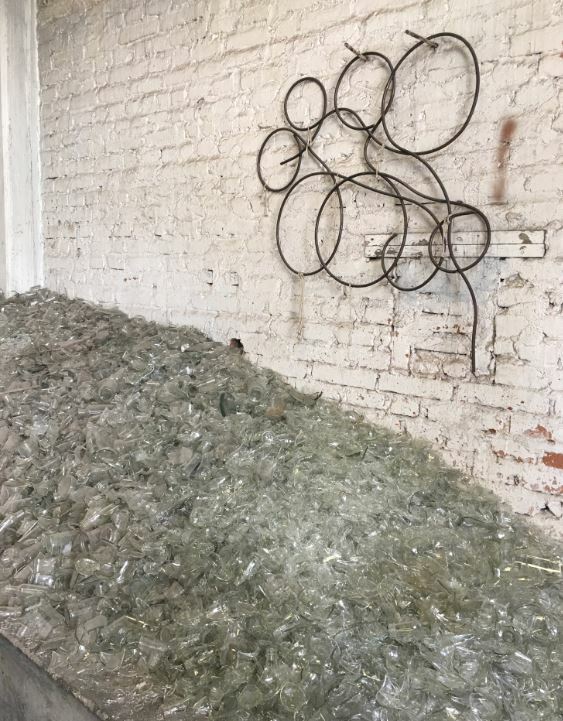 The founders created their glass workshop with two goals in mind: to restore the noble art of hand-blown glassware and to bring a newel level of sustainability to every step of the production process. Are you still looking for an original sustainable Christmas gift? These glasses deserve a spot in your interior! Why a brand & webshop for contemporary Mexican design?